On Tuesday, we delved into some baseball history. Today, we’re going to look at some baseball future. Atlantic Shore beat Mountain Home, Ark., 2-0 on Tuesday in the quarterfinals of the 14 and under Babe Ruth World Series 2016. 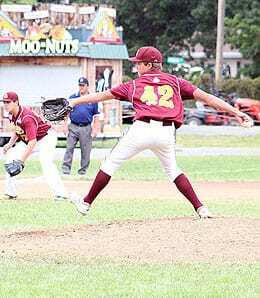 The win was spearheaded by pitcher Brian Furey, who tossed a no-hitter. Next up, Atlantic Shore moves to the semifinals on Wednesday, facing top seed Bismark, N.D.
Furey, who usually catches, will graduate from high school in 2020. He’s already 5’11, 180, so bears watching as a keeper league prospect. We recommend keeping tabs on him as he moves into high school. Switching gears, a few things caught our eye from Tuesday’s action around the majors. How good did Trevor Cahill look in his first start in 16 months? He came off the DL to start the opener of a double-header and hurled five shutout innings of two-hit ball, striking out three and walking two. With John Lackey (shoulder) hurting, Cahill could get another start, so give him a look in very deep NL-only leagues. When Cahill’s sinker is working, he can get the job done (see video below). Speaking of good, what about Boston outfielder Mookie Betts? He’s been moved into the cleanup spot the past two games, and continues to mash, spanking two dingers Tuesday after exploding for three long balls on Sunday. Very quietly, Betts is in the top seven in the AL in BA, homers, RBI, runs, steals, slugging and OPS. Um, he’s going to get some MVP votes. It’s hard to envision anyone but Jose Altuve walking away with the hardware, but Betts is pretty damn close — especially if Boston makes the playoffs and Houston doesn’t. Michael Pineda continues to frustrate us with his inconsistency. A couple of good starts, a couple of bad ones. He had put up five shutout frames against the Jays before rain halted his outing. We’ll be very interested to see how Pineda does against his former team Seattle on Monday. Which version of himself will show up? We’d advise rolling the dice here. Remember how good Vince Velasquez looked at the beginning of the season? This month, he’s getting raked through three starts and 15 1/3 IP, having given up 21 hits, 16 runs (all earned), six homers and six walks. You’ve got to love the Ks (22), but this month is tarnishing what’s been a great season otherwise. Sit Velasquez until he works his way out of this funk. Corey Kluber sure didn’t look like a Cy Young winner over the first two months of the season, but he’s rounding into form now. After another solid outing Tuesday, he’s won four straight and has recorded a 1.65 ERA over his last seven starts. We may never see his 2014 form again, but he’s definitely done a great job bouncing back from last season — especially given his lousy start to the campaign. Now it’s your turn. Let us know in the comments below what your impressions of the Babe Ruth 14 and under World Series are. This entry was posted on Wednesday, August 17th, 2016 at 2:50 pm	and is filed under Babe Ruth Baseball, BASEBALL, Fantasy Notes, Prospects, RotoRob. You can follow any responses to this entry through the RSS 2.0 feed. Both comments and pings are currently closed.